In this article I will show you how you can validate user login form without page refresh using jquery in asp.net and c#.net from sql server Data base table. Some of my previous articles are as follows: Validate DropDownlist Selected Value Using jQuery In Asp.net ,C#.Net, Bind and Validate GridView TextBox Value by jQuery In Asp.Net Using C#, Asp.net, C#.net and jQuery articles, Add, Remove, Validate CSS Class Applied To a HTML Control In Asp.Net Using jQuery., jQuery DatePicker Calendar With Slide Effect on TextBox Click In Asp.Net. 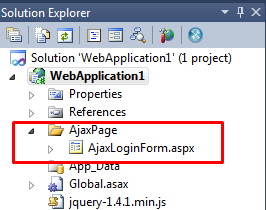 So for this article first we will create a new asp.net application and create a new Ajax folder into the solution as shown below and add Ajax form in this folder. Here is the sql table for data. Now add the below code to validate the login for. <asp:Label ID="lblmessage" runat="server" Style="color: #FF3300; font-weight: 700"
In above jquery code I have given the path of the ajax file in jquery ajax function. In url I have passed the user id and password as request query string. Now check the ajax form code. Now remove the complete html tag from ajax form by keeping page tag. 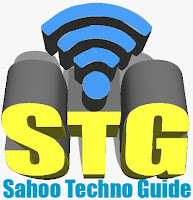 <add name="con" connectionString="Data Source=DELL-PC;Initial Catalog=Demo;Integrated Security=True"